Kim Dotcom, born Kim Schmitz in Germany in 1974, founded the internet file-hosting company Megaupload. In 2012 the FBI began seeking his extradition to the US for copyright infringement. Kim Dotcom, who holds German and Finnish nationality and is residing in New Zealand, is battling his extradition. Here you can find an automatic compilation of all DW content refering to Kim Dotcom and his company. A police dawn raid on Kim Dotcom at the Internet mogul’s home in New Zealand in 2012 has ended in a monetary settlement. The German-born entrepreneur is still fighting extradition sought by the USA. German-born internet entrepreneur Kim Dotcom and three of his colleagues can be extradited to the US to face criminal charges, a New Zealand judge ruled. The long-running legal battle is expected to continue for years. Kim Dotcom's appeal against extradition to the US will be streamed on YouTube from the Auckland High Court, a judge has ruled. The Internet entrepreneur is wanted in the US to face charges of copyright infringement. 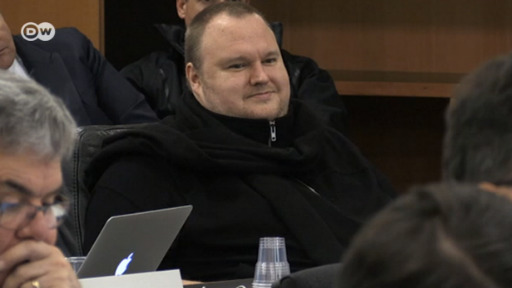 Kim Dotcom's extradition appeal hearing has begun before a New Zealand court. A judge has yet to decide whether to allow livestreaming of the high-profile trial, which Dotcom argues would ensure transparency. The legal saga of one of the world's most recognizable internet entrepreneurs enters a new phase on Monday when Kim Dotcom is set to appear before a New Zealand court to appeal his extradition to the United States. German tech entrepreneur Kim Dotcom has lost his battle to be extradited from New Zealand to the US. The decision comes almost four years after NZ police famously raided his mansion and shut down his popular website. A hearing is under way in New Zealand to decide if German tech entrepreneur Kim Dotcom can be extradited to the US to be tried on copyright infringement charges. The case has possible implications for Internet freedom. The Nasdaq Composite Index broke through its 15-year-old record on Thursday. Higher oil prices and solid earnings reports contributed to the rise. China's technology shares are climbing at a tearing pace. However, the boom won't end with a crash as it did once on Wall Street, writes DW columnist Frank Sieren. Earlier this month the US stock market Nasdaq reached 5,000 points for the second time in its history. But that's not necessarily good - the first time was in 2000, just days before the dotcom market crashed.